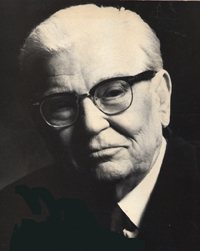 Dr. Robert H. Bitzer ( 1896 - 1994) Founder and Spiritual Director of the Hollywood Church of Religious Science, wrote several books and gave hundreds of classes during his career. The Hollywood Church of Religious Science was the Hallmark Church in the Religious Science movement. Even today, Dr. Bitzer's tapes are treasured by people all over the world. His lessons on Spiritual Mind Treatment (also known as Scientific Prayer) are masterful teachings. The only book currently in print is his "Collected Essays of Robert Bitzer" "All Power To You" is out of print, but can be read on this site with a forward by Rev. Henry Lee Bates. Dr. Bitzer's words created statements and treatments that filled the mind with absolute authority and conviction. He is truly one of the greatest metaphysicians of the 20th Century. His work, if studied and embodied, can change someone's life completely. His work is known all over the world and the "Meditation Of Thankfulness" below has been read by thousands of people as well as "The Law Of Mind." "No matter what you are attempting to do, always get the vision before you begin to work. See the completed demonstration. If you are buying a house, think of it as completely furnished and completely paid for. Even though you may take out a mortgage on it, treat that it is completely paid for. For the first property our church bought, we worked that way. Instead of waiting twenty years to pay off the mortgage, we did it in eight years." "As for money. I have never worked for money. I depend upon divine Principle. I have never experienced lack, because I know the source of my supply. I never depend upon the channel but only on the source. I am open to all avenues through which my good comes. I thank everyone who is an instrument and show my appreciation, because no one has to be a part of my demonstration. However, the source blesses and prospers everyone that it uses. Understanding this law, we are never imposed upon, nor can we impose upon someone else. Bless everyone through whom your good comes. I have always been governed by this law - long before I ever heard of metaphysics." Into the lives of those around me. That within me thou hast created the desire for Good.